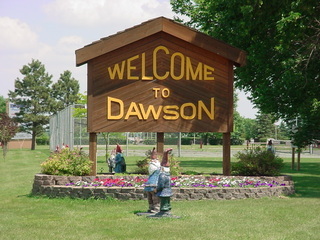 Dawson is a progressive community located in the prairies of west central Minnesota striving to maintain a quality of life surpassed by none. The Lac Qui Parle River flows through the community providing an environment of quiet and stress free living. Gnome Park or Swimming Pool Park is where you will find all the gnomes celebrating outstanding citizens from the community. Check the kiosk for the information in regards to each gnome. Swimming Pool Park also has playground equipment, volleyball court, tennis courts, basketball courts and shelter houses. The park and Dawson Aquatic Center is located adjacent to Highway 212 on the east end of Dawson. Looking for a great place to set up camp? Veteran’s Memorial Park offers scenic camping and picnic area with a beautiful walking trail. Make sure you head over to Dawson’s nine hole golf course located on the west side of town. Head over to Dawson at the end of June for their annual town celebration Riverfest! For more information, please visit the City of Dawson or the Dawson Chamber of Commerce.